McAllister, Shirleen Lorna died 12th April 2019 peacefully at Marie Curie Hospice. Dearly loved daughter of the late Alex and Madge Walmsley, and much loved sister of Terry. Funeral service will be held in Belfast City Mission, Bloomfield Drive, Belfast on Tuesday 16th April at 1.30pm and afterwards for burial to Ballygowan Free Presbyterian burial ground. 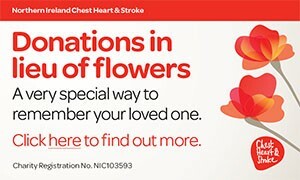 Family flowers only please donations in lieu to Marie Curie Hospice, 1 Kensington Road, Belfast, BT5 6NF. Will be sadly missed by all her loving family circle. Called Home April 12, 2019. Deepest sympathy to the family circle. I am sorry to tell you that Shirleen Lorna McALLISTER has passed away.